HomeArticlesWhat is Project Dragonfly Google search engine in China ? Dragonfly Search engine of google in china facing problem. Google has values and principles to support search of people. No government has right to Censors on people’s search engine. we aren’t discussing about adult content or unsecured activity for nation. But, here the values of Google are being compromised through Dragonfly in China. That’s why employee of Google are protesting against it. Because of Dragonfly, Google is experiencing ‘moral and ethical crisis’. Dragonfly is a search engine. It is prototyped by Google and designed to be compatible with China’s state censorship provisions. As we know that, the search engine Google is banned in China. Now, Google is trying to recapture vast market of China to trap. To trap for that Dragonfly a new search engine in China. Dragonfly will not show users that search terms which are censored by Chinese government. We know that in various country vulgar things like Pronography, child violation like things Google automatically censored but, Political things are not censored. Dragonfly will censored those material which are against chinese government without giving any information to users. The reason behind it China doesn’t have Democracy like USA and India. China always keep it’s citizen away from Protesting against government. So that revolution will not occur. 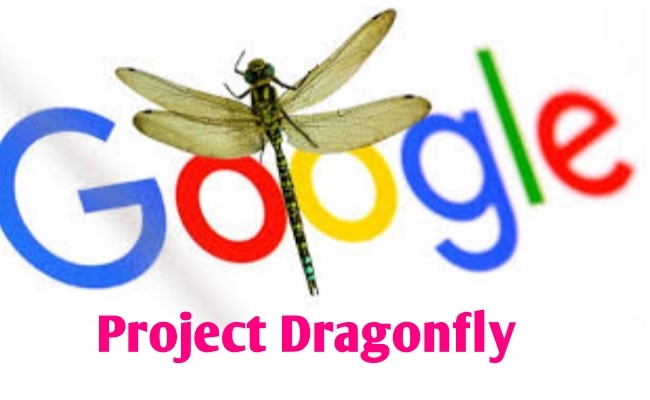 Google executives has stated that the project Dragonfly is exploratory in the early stage and the Google was not close to launching search product in republic of China. In October 2018 presentation, CEO of Google Sundar Pichai discussed about project Dragonfly . He said that, ‘ We don’t know we would or could do this in China but, we felt that it is important for us to explore in China. As we know China has highest population amongst world. It is lucrative market for Google, but the company is stood on it’s values and principles that’s why it is not earning profit high. Google has stopped servicing China through Google.cn since March 2010. From, 2010 internet users of China increased 70%. Currently, 772 million internet users are active in China and figure could go up to 1.5 billion in next some years. It means that Google has large Scope to earn revenue from through advertisement runs on it’s search engine. Here, China has capacity to spend more as compare to India. After the ban of Google in China, the company lost a lot of revenue from country since 2010. For Google, it was 30% of increase in revenue in 2018 from India. It is more than double revenue compare to last 3 years. Turnover of revenue from India in 2018 is RS 9337.7 crore a compare to 7209 crore in 2017. So, It is estimated that the company can earn $3-4 billion from China easily. When, Google.cn was banned in China, it was loss to Google but reverse to that it was benefit to local Chinese company like Baidu, Sogou. These companies are not perfect search engine company as like Google but updated itself regular basis and earns $4-6 billion from China yearly. China has plan to launch these 2 company in South Asia and surrounding of China. So it is not easy to Google fight with these 2 company and expand it’s business across China. So, overall Google is losing it’s Values and Principles to earn more revenue. Even if employee of the company writting letter to CEO Sundar Pichai and Protesting against search engine project Dragonfly in China. What’s up, just wanted to say, I loved this post. It was funny.Keep on posting!